If you are already married to each other but wish to have another ceremony to renew your vows and celebrate your love for each other, then these ceremonies are for you. 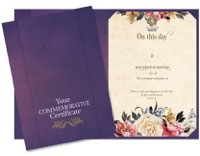 The ceremonies are often linked with 'special' anniversaries, but can be held at any time of your marriage. Maybe you got married abroad and want to celebrate in the UK with family and friends? Maybe you have just been through a difficult period together and want to mark a new beginning? Whatever the reason, they are always memorable and moving events. If you have children special mention can be made of them as very important people in your lives. Exchanging new wedding rings or using original ones. There is no need to take them off if you don't want to, as they can be re-dedicated. Two witnesses will be asked to sign your commemorative certificate which will be presented to you at the end of the ceremony. 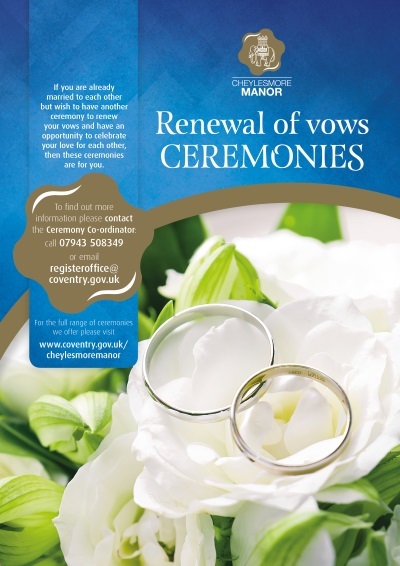 The ceremonies usually last for about 15 - 30 minutes, and can be held in the historic Cheylesmore Manor House which houses the Register Office, or a venue that has been approved to hold civil ceremonies, a full list of which is available on request. 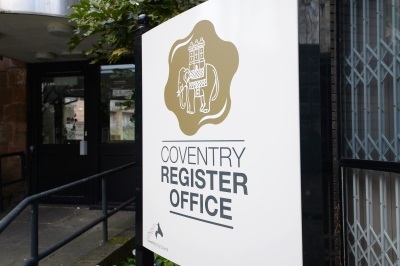 If you are interested in booking one of these ceremonies and would like to make a ceremony coordinator appointment with our Ceremony Coordinator then please complete the online contact form or email ceremonyco-ordinator@coventry.gov.uk. Please note: renewal of vows ceremonies have no legal status and are not legally binding. Your Marriage Certificate will need to be shown before a ceremony can be booked.